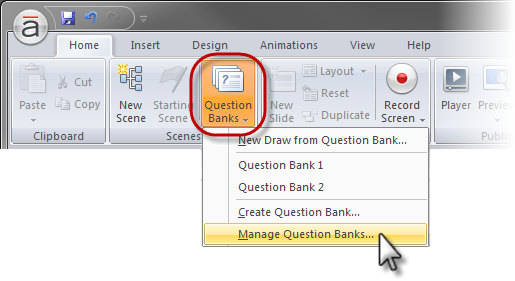 In this tutorial, we'll explore how to create, edit (populate), and manage question banks. By default, one question bank will always exist in a story. Initially it'll be empty until you add or import questions to it. 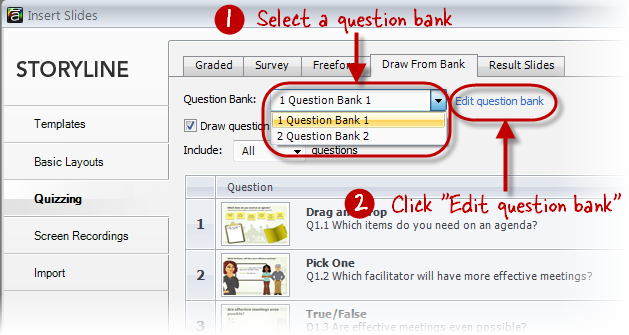 You can create as many additional question banks as you like, using the steps below. 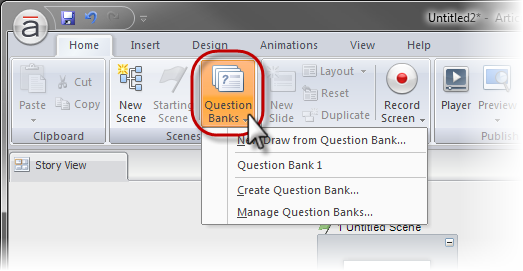 To learn how to edit the default question bank, called Question Bank 1, see the section in this tutorial called Editing question banks. In Story View, select the Home tab. Or, select Manage Question Banks, and then click the "Create a new question bank” button. Or, select Manage Question Banks, and then click the “Duplicate the selected question bank” button. An empty question bank will open. The next section of this tutorial will describe how to populate it with slides. 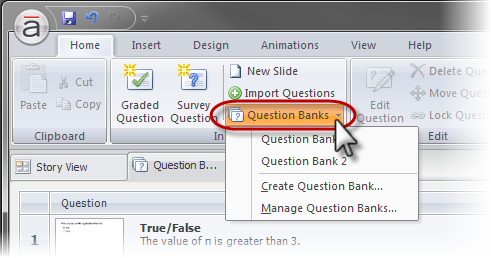 When you edit a question bank, you can add, delete, and rearrange slides. You'll also be able to open individual slides in Normal View for editing. In Story View, go to the Home tab. Click the Question Banks button, and select the name of the question bank that you want to edit. Or, open the Insert Slides dialog, and select the Quizzing tab on the left. Then select the Draw From Bank tab at the top of the window. Select the question bank that you want to edit from the Question Bank drop-down list, and click the Edit question bank hyperlink. 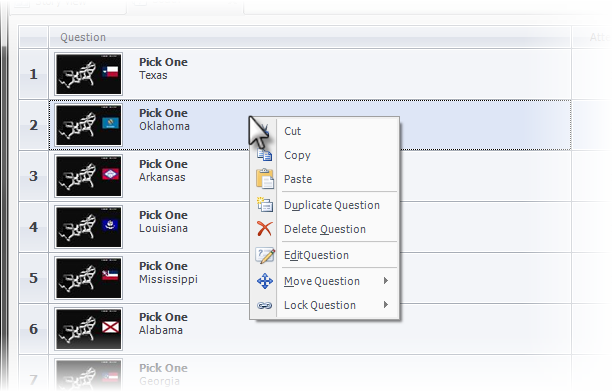 The Cut, Copy, and Paste buttons can be used to duplicate or rearrange questions within your question bank. They can also be used to move or copy questions from scenes in your story into your question bank and vice versa. 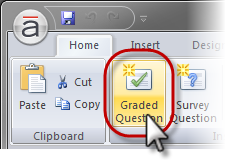 Graded Question allows you to create a new graded question in the question bank. Survey Question allows you to to create a new survey question in the question bank. Use the Import from drop-down list to specify whether you want to import slides from scenes in the Story or from other Question Banks. Use the corresponding Import drop-down list to specify whether the imported slides will be copied into the open question bank or whether they will be moved from their current location into your question bank. Select the slides that you want to import by marking the appropriate check boxes to the left of each slide thumbnail. You can also click the Include All check box to the right of any scene or question bank to quickly select all the slides in that particular scene or question bank. Then click the OK button to complete the import process. Edit Question allows you to edit the selected question or content slide in Normal View. When you’re in Normal View, you can edit the content directly on the slide. 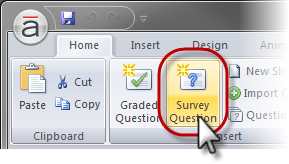 If you need to change other things about a question that aren't visible on the slide (such as the scoring, number of attempts, or how feedback is handled), just click the Edit button in the Question panel that appears to the right of the slide workspace (like the example in the image below). This opens the question editor, where you can make whatever changes you need. Delete Question allows you to delete the selected question or content slide. 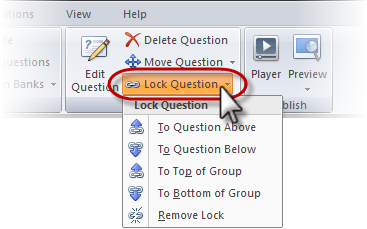 The Lock Question drop-down list allows you to lock the selected question or content slide in a specific location, which affects how they will be shuffled (if you choose to randomize the questions when you draw them into your story). You can lock a slide To Question Above / Below or To Top / Bottom of Group. You can also choose to Remove Lock if you change your mind. You also have access to the Triggers panel on the right side of the screen where you can quickly add, edit, delete, and rearrange triggers for the selected slide. To learn more about managing triggers, check out this tutorial. Click the Question Banks button, and select Manage Question Banks. Create a new question bank by clicking the “Create a new question bank” button (the icon that looks like a blank piece of paper) in the lower left corner. A new question bank will be added to your list of question banks, and the name of the question bank will be editable. Type the name you want for your new question bank, and then click anywhere on the list of question banks to save the change (or press the Enter key on your keyboard to save the change and immediately open the question bank for editing). 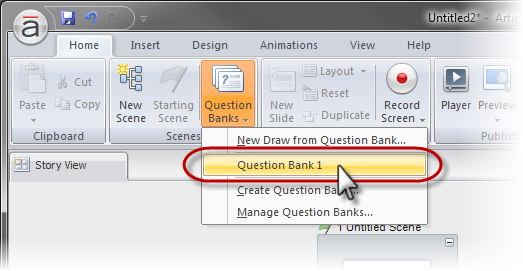 Edit an existing question bank by clicking the “Edit the selected question bank” button (the pencil icon). Refer to the section above for editing options, such as adding, editing, deleting, moving, and locking questions. Tip: You can also double-click on the name of any question bank in the list to open it for editing. 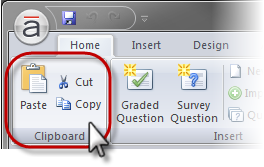 Duplicate an existing question bank by clicking the “Duplicate the selected question bank” button (the icon that looks like two windows). 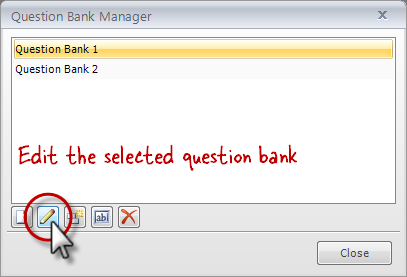 Rename an existing question bank by clicking the "Rename the selected question bank" button (the “ab” icon). 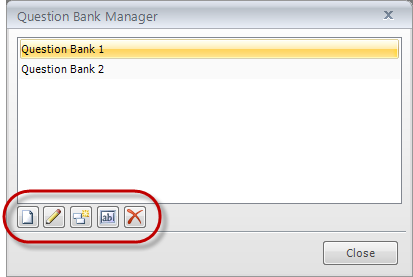 Delete an existing question bank by clicking the “Delete the selected question bank” button (the red X).